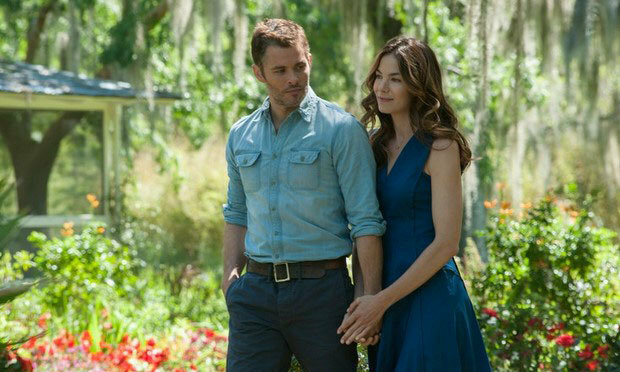 Nicholas Sparks adaptations aren’t just their own genre, they’re their own ecosystem – if there was any semblance of how real people actually behaved, a koala would die. If there wasn’t a moment that didn’t feel like a copy of a copy of a copy of the previous Sparks, outing toads would multiply and ravage the countryside. The Best of Me is the latest Eco disaster from Sparksville, Rep. of Sparks. After miraculously surviving a rig accident, roughneck Marsden receives a vision of a girl from his youth (Liana Liberato playing a young Michelle Monaghan, but because Liberato looks nothing – absolutely nothing – like Monaghan this moment doesn’t resonate). So Marsden reckons it’s a sign when a will reading forces him to return to his hometown where he and Monaghan/Liberato enjoyed a teenage romance one only enjoys in Sparksville. Meanwhile, after receiving the same will notification, an unhappily married Monaghan makes the trip back home. What could have possibly driven these two lovebirds apart? The Nicholas Sparks environment. Safe and familiar and predictable. It’s here patriotic, handsome white boys with unkempt hair and tight vests fix car engines. They call girls "ma’am" and discuss their college dreams like a kind 30-year-old poet (or a 48-year-old Nebraskan writer?). In Sparksville, rich daddies are willing to pay for poor boy’s college tuition if boy backs off from daughter, sparking a dignified rebuttal. Letters are read on swings in back gardens at sundown. Brawls are broken up by the 'unexpected' off-screen gunshot. The Best Of Me, is set in 1992, not 1870 by the way. Luke Bracey, playing a young James Marsden despite having no facial similarities with James Marsden, looks about five years younger than his onscreen redneck father Rob Mello. Casting really didn’t get their arms around this (Marsden a roughneck? Come on) and neither did makeup, with poor Bracey sporting what must be one of the worst black eyes in recent movie history. But the Sparks poison does far worse than making Marsden and Monaghan look stiff and bland in their tired plot. When The Lemonheads’ Into Your Arms is used here the band sound like just another American Idol wannabe, while syrupy version of Velvet Underground’s Sweet Jane just sums everything up really. Only Gerald McRaney comes out of this with his head held high. Tepid, sugary, clichéd, forgettable fluff.